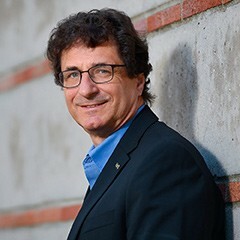 Robert Cutietta is dean of the Thornton School of Music and the Kaufman School of Dance at the University of Southern California. Since 2002, he has overseen an expansion in endowment, programs, and space within Thornton while building upon the traditional quality of education that is the school’s trademark. Under Dr. Cutietta’s leadership, the Thornton School has introduced innovative new degrees in music education, arts journalism, visual and performing arts studies, choral music, vocal jazz, and the groundbreaking popular music performance program. In the fall of 2014, a graduate degree in Music Leadership was introduced further positioning the Thornton School as an innovator in music instruction. In 2011, he was asked to create the first new school at USC in 41 years; the Glorya Kaufman School of Dance. Since then he has overseen the hiring of the entire faculty and staff of the new school as well as the construction of the 59,000 square foot Kaufman International Dance Center. The Kaufman School officially opened in the fall of 2014. In 2010, USC Thornton moved into a combination of new and newly renovated spaces, constituting a 40% increase in physical size. A new practice room facility, orchestral rehearsal hall, and amplified rehearsal hall was added to totally renovated homes for jazz, studio/jazz guitar, student services, film scoring, and technology. During his tenure, the Thornton School’s endowment has seen a dramatic increase with the addition of five new endowed faculty chairs and one professorship, tens of millions of dollars in new scholarships, and funding for new endeavors such as an ensemble touring fund and a travel fund for student finalists in national and international competitions. He has been especially effective supplementing the already illustrious faculty with new world-class artist/teachers such as Midori, Bob Mintzer, Glenn Dicterow, Ralph Kirshbaum, Patrice Rushen, Peter Webster, Lamont Dozier, and Young Guru. Since 2006, he has hosted “Ask the Dean,” a popular weekly segment on Classical KUSC, the largest classical music station in the nation. He has also performed and composed music for television and movies. He is a founding member of Montana Public Broadcasting and currently a member of the Advisory Board of Classical KUSC Radio in Los Angeles, The Orange County School of the Arts, The Maestro Foundation, and the GRAMMY Blue Ribbon Adjudication Committee. He is listed in Who’s Who in America and was designated the 2001 Alumni of the Year from the College of Arts and Architecture at Penn State University. In 2007, he received the Amicus Poloniae Award from the Government of the Republic of Poland. Cleveland State University awarded him the 2008 Alumni of the Year from the College of Arts and Letters. He has published a wide range of articles on many subjects related to music education. These have appeared in journals such as The Music Educators Journal, Journal of Research in Music Education, The Bulletin of the Council for Research in Music Education, Psychology Today, The Psychology of Music, The American Music Teacher and many others. He is also author, co-author or editor of four books and has contributed chapters to several others including The Handbook of Research on the Teaching and Learning of Music. He has sat on the editorial boards of the Journal of Research in Music Education, and Contributions to Music Education. His two most recent books are Raising Musical Kids: A Parent’s Guide (2013), and Who Knew? Answers To Questions About Classical Music You Never Thought To Ask (2016) both published by Oxford University Press. Prior to his appointment as dean, Cutietta had a successful career as a musician and researcher. He was director of the School of Music and Dance at the University of Arizona and held faculty positions at Kent State and Montana State Universities. He received his doctorate in music education and psychology from Penn State University and his undergraduate and masters degrees from Cleveland State University. Raising Musical Kids: A Parent’s Guide. Oxford University Press, 2013.